A showing of 22 festively decorated boats, continued a Manatee County holiday tradition several years in the making. For Manatee County, the Annual Holiday Boat Parade always draws big crowds to the downtown areas of Bradenton and Palmetto. For 2017, a greater number of participants meant that the parade carried on from about 6 p.m. until 9 p.m. when the last boat named Arrk passed by PIER 22. 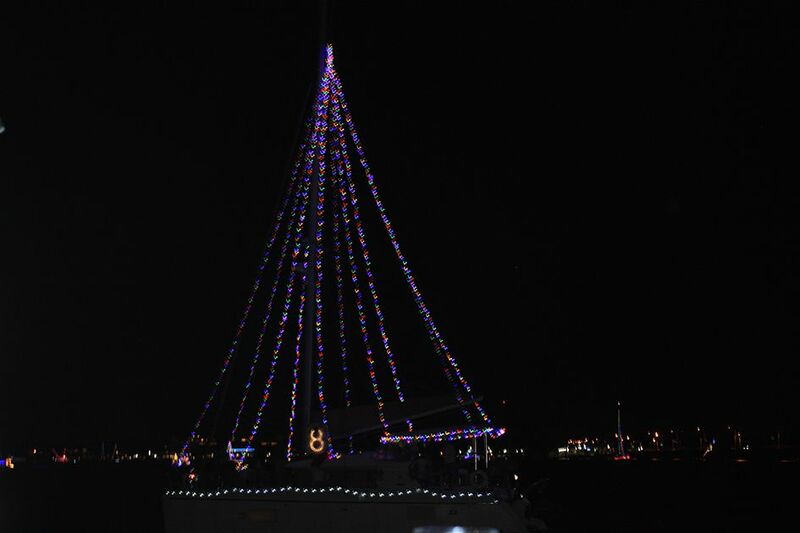 During the awards ceremony, Twin Dolphin Marina Manager and Holiday Boat Parade Committee member, Cynthia Belfatto said that she was delighted to see the number of vessels performing in the boat parade increase from about 17 to 22 and she expressed thanks to the many captains that took part in making the night a success. In the over 40 feet category, Captain Heath Daughtry and vessel Yellowfin took first place. Second place went to Captain Eric Ramsey with vessel EW-WE II. Captain Gary Alderman with vessel Shacar was awarded third place. In the under 40 feet category, Captain Steve McNutt with vessel Down Under won first place. Second place went to Captain Gary Morgan with vessel Sassy. Third place went to Captain Layne Oslrander with vessel Snapper Addict II. Cash prizes ranged from $150- $500. From the boaters performances to the cheering crowds at the many judging spots along the river, the winter holiday event is extremely interactive in nature. A special viewing party took place at PIER 22 where audience participation helped decide points for captains and their vessels. PIER 22 guest judges included Vice President of the Manatee Healthcare System, Vernon DeSear and Executive Editor & Vice President of the Bradenton Herald, Joan Krauter. "It's a great privilege for PIER 22 to be able to take part in the way that our community celebrates the holiday season, and the parade is always a boatload of fun," said PIER 22 owner Hugh Miller.